We all have a story to tell....what's yours? What started off as a Facebook conversation, thanks to my dear friend Melvin Spencer, my work has evolved into a collection of apparel. I never thought I'd see my photos on fabric, more less garments! Thanks to Tony Truong from Hisego Enterprises for showing me what was possible. Let me be clear....I don't design the garments...I just have my photographs/digital art printed on the fabric. I work with an overseas manufacturer who prints and tailors the apparel. One day, I was looking for a manufacturer who made umbrellas and came across this sight. They not only manufactured umbrellas, but a whole line of apparel! This was a God send! It was perfect for what I wanted to do. A "one-stop shop" ….print and sew! As much as I wanted to have things manufactured in Hawaii, I could not find the perfect fit, so I decided to go with this company. One day as I was sitting out on our patio having my daily morning prayer and meditation, I felt my Mom's presence very strongly. I had my eyes closed and then I experienced a vision of her in the Pua Melia Blue print. It was as if she was telling me "do not give up". I knew I had to get busy and stay the course, after a year of feeling like I kept hitting walls in the process. So I ordered some sample garments and gathered my dear friends Melanie, Lyla, and Bernie to be my models. Thank you ladies....you are all beautiful and I am grateful for your love and friendship! Mahalo also to the beautiful Keone, Hau'oli, Chris , Lisa, & Michele ; the handsome Lee ,Dane, Keola, Ronnie, and Robert ; and the my darling niece Danni, for being friends turned models for me!! I am grateful for Keith's patience and love as I walk this path. I am grateful for my Dad and the rest of my family who have encouraged me with endless support. I am grateful for the many friends who have offered their suggestions and believed in me. I am grateful to GOD...for Divine Guidance and Wisdom...for the creative gift He has blessed me with...for showing me my purpose in this lifetime ...To Love, Create, Inspire... for the COURAGE to live my purpose and be my authentic self. I have realized that creating is what makes my "soul sing". It brings me complete JOY to create and to share the finished products with you. 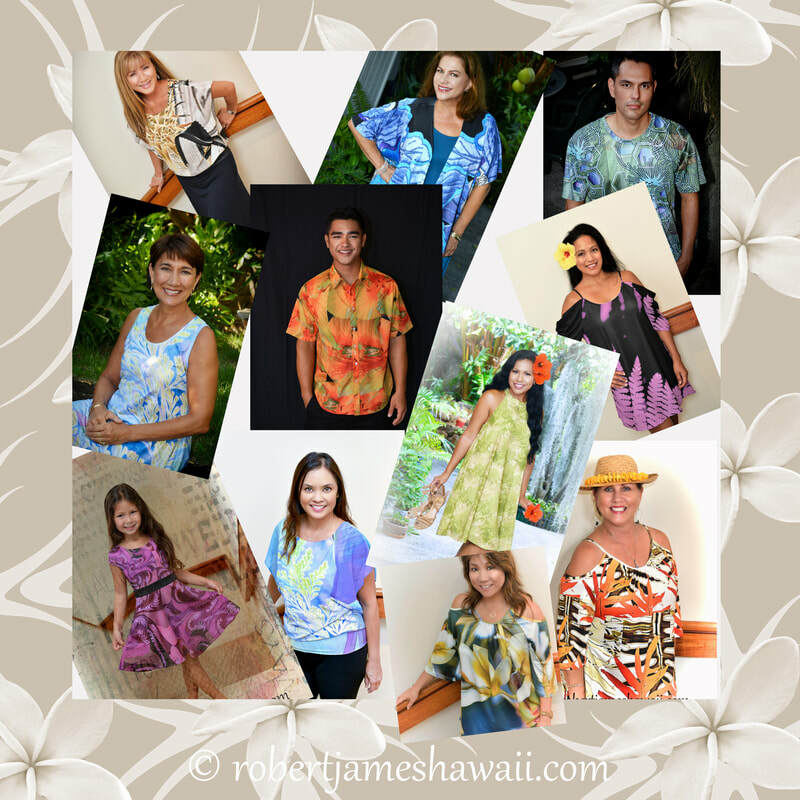 It is my hope that when you wear any of the garments, you will "feel" ALOHA and feel good about who YOU are! Every photograph and print that I have used in my designs tells a story. In essence you will be wearing not just my art, but a piece of my heart....I know that sounds corny, but it's true. Mahalo for sharing my journey with me.​ I am GRATEFUL! P.S. ALL ORDERS ARE "MADE TO ORDER" AND TAKE APPROXIMATELY 4 WEEKS TO PROCESS AND SHIP. Mahalo for your patience! !